Having chosen some of the highest priced packages to present as the favorites on the homepage immediately gives you the impression that ResumeWritingService.biz is an expensive service. However, you will learn that they have various prices for different services, all of which will be discussed in our ResumeWritingService.biz review. The list of services at this company is not as good as we expected, but can be considered solid. Aside from their resume writing and editing services, Resume Writing Service biz also offers candidate screening, resume distribution, LinkedIn profile development, interview coaching, reference verification, and cover and follow-up letter writing. This makes for a limited, yet acceptable list of services offered. If you were aiming to find a company that will help you write or distribute your resume, this would be a nice choice considering that their focus is solely placed on job candidates. The lack of information regarding the delivery and different resume types is very concerning. Aside from the many promises and statements such as ‘the best resume writing service’, the company failed to provide details regarding their few services. If you decide to order here, we recommend getting this information from the customer service first. 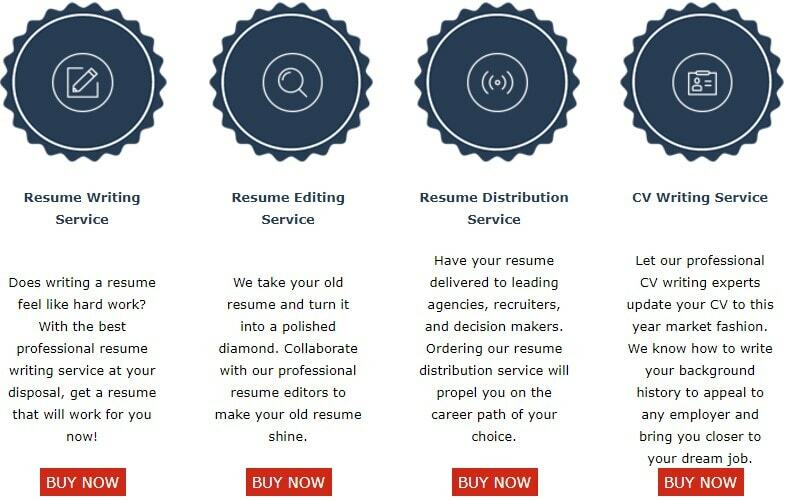 Yes, there are numerous pricing packages on the website, but overall, this is not a cheap resume writing service. Except for the cover letter that costs only $31, resumes at ResumeWritingService.biz are very costly. 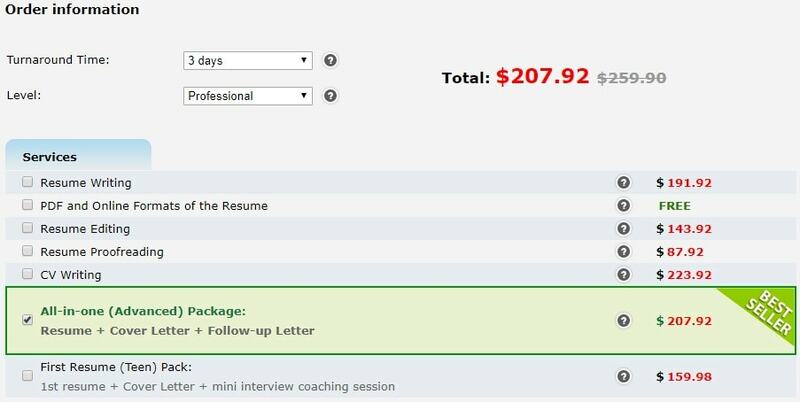 For example, you need to pay $95.96 only for resume writing, while packages with several services cost up to $279.96! This makes for one of the most expensive services on the web, as suggested in other ResumeWritingService.biz reviews. Therefore, if you got the impression that this company is an expensive one when you saw the homepage, this was generally true. Not only the company has very steep prices, but they actually failed to add some discounts for the loyal or new customers. You won’t get any privilege from being the company’s returning customer, nor will you be able to enjoy a reduced rate because you are trying the service for the first time. The quality of resumes here is bad! We paid a fortune for a small package they called ‘the bestseller’, but we were not at all satisfied by the results. This package is named All-in-one Package and costs $103.96. Its pricing is very steep, especially when you consider that it only contains the basics: resume, cover letter, and follow-up letter. However, seeing that this is what most job candidates usually want, we decided to go for it. Unfortunately, the resume contained several concerning mistakes and was badly formatted. In other words, it is one of the first resumes that get thrown away after employees first see them. No guarantee? We found this to be very strange, especially for a resume writing service. So far, we haven’t found such a company that does not offer at least a minimal refund in case their resume does not get you any job, or free revisions in case you don’t like it. Unfortunately, this meant that we did not get a revision on our bad resume. The customer support service responded promptly and the agent was very pleasant to speak to, but there wasn’t really much to say when she informed us that we are not entitled to a revision. Seeing that they do not have any guarantees, we don’t see a reason why anyone would need the assistance of the customer support service. Overall, resumewritingservice.biz is a costly resume writing service, which makes it a bad choice for your job application. In most cases, people who apply for jobs and need resumes do not have an income, which means that such prices are outrageous for the target customers in the industry. In addition to this, the company has no guarantees that provide you with safety when you order your resume here. Even though they have some interesting packages, that is simply not enough for a service to be good. I don’t like resumewritingservice.biz. Their timing is good, but the resumes are not as great as they promise. What I got was something that looked like those automatically filled templates, only I got charged a very high fee for it. Kenneth, thanks a lot for your feedback! When I got my order from them, I just had to go online and write this resumewritingservice biz review. Don’t use this company, people! It is the most awful, unprofessional resume writing service there is. You cannot find their customer support anywhere. I actually got my order THREE days left and there was no one to reply to my complaints!